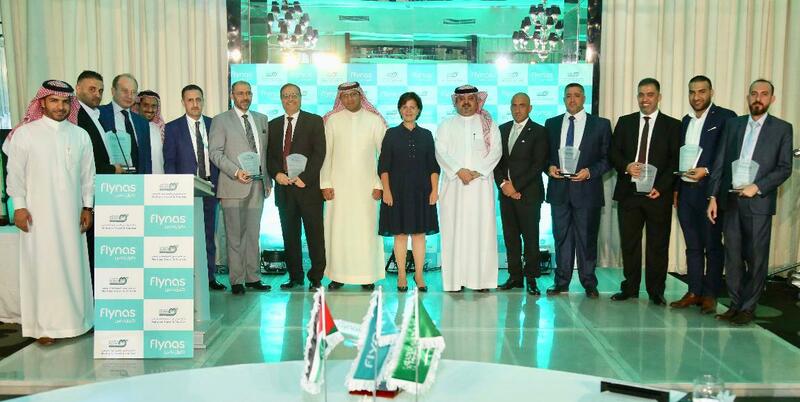 Riyadh, Saudi Arabia, October 3, 2018: flynas, the Saudi national air carrier and leading low-cost airline in the Middle East, held a ceremony to mark the 10th anniversary of launching its flights to Jordan and to honor its travel and tourism partners. The ceremony was held at Rotana Hotel in Amman on Tuesday, October 3, 2018, in the presence of His Excellency the Minister of Tourism and Antiquities of Jordan, the Deputy Ambassador of the Custodian of the Two Holy Mosques and the chargé d’affaires of the Saudi Embassy in the Hashemite Kingdom of Jordan, as well as officials of Queen Alia International Airport and the Executive Management of flynas. Through this ceremony, flynas aims to honor its travel and tourism partners who have contributed to the success of its expansion strategy since the launch of its flights. Amman is considered one of flynas’ first destinations, as the first flight from Riyadh to Amman was launched in July 2008 and the first flight from Jeddah to Amman was launched in July 2009. On this occasion, the Director General of International Sales of flynas, Mr. Abdul Ellah Al-Eidi, said that this ceremony, which takes place in the Hashemite Kingdom of Jordan, emphasizes the importance of Amman, which was one of the first destinations of flynas’ flights since 2008 to this day. Mr. Al-Eidi expressed his appreciation for the efforts of flynas’ travel agents, valuing their support to flynas, the Saudi national air carrier and leading low-cost airline in the Middle East. He noted, “flynas has 12 weekly flights to Amman during its winter schedules, seven flights from Riyadh and five from Jeddah. During summer, flynas operates 21 weekly flights to Amman; 14 flights from Riyadh and 7 flights from Jeddah to the Jordanian capital”. In this regard, he stressed, “The success of flynas expansion strategy, has been translated by the company through many achievements, the most important of which was transporting six million five hundred thousand passengers on our flights during 2017, and we expect this number to increase significantly during 2018 due to the presence of partners committed with the highest standards of excellence”. Mr Al-Eidi expressed his pride in flynas’ achievements over the last 11 years since its establishment and wished to reach more achievements and partnerships with neighboring countries, especially the Kingdom of Jordan.